Please accept my sincere thanks for all the prayers that you sent for my FIL and for extending all your support to this blog in my absence. This is my first post after Daddy passed away so I thought of sharing something which he was extremely fond of and was one of his favorites. This preparation is dedicated to Daddy with a sincere prayer for his journey in the other world. ‘Appe’ means a kind of crisp poori, ‘karad’ means fried and ‘hakkidda’ means to put in and ‘Payasa’ means Kheer in Kannada, so together it means fried poori put in a kheer. This is a traditional Kannadiga preparation and is made on all occasions. I tasted this first time after marriage when Mummy made this for her group of kitty friends and I realized then that it was Daddy’s all time favorite and Mummy would make this affectionately for Daddy on his birthday and all religious functions. I loved it the very first time I tasted it and became my favorite too but for some strange reason I always had it when I went to our home town and never attempted making this at home. After coming back I was in no mood to cook elaborately for a few days, eventually when I thought of posting something in remembrance of dear FIL, I could not think of any other preparation but this Payasa/ Kheer. I was initially hesitant to ask my MIL for the recipe so I called up my elder co- sister for the recipe and she advised me to use APF and wheat flour to make the Appe. But somewhere I thought Mummy did not make that way and after trying to recall the recipe, I had a feeling that Mummy had mentioned semolina to me once, so I called up MIL and confirmed the recipe. So here’s Daddy’s favorite payasa.. Mix the APF and Semolina with the clarified butter and knead a tight dough using water. Let the dough rest for half an hour. Take small dumplings of the dough and roll it thin and cut into strips. Deep fry the strips on a medium flame till crisp. Remove the fried strips (Appe) on a kitchen towel and let it cool and then crush them coarsely. Boil the milk, add sugar and let it reduce for about 5 mins and then add the crushed Appe, cook for about 2 mins. Cool and add cardamom powder, soaked saffron , nutmeg powder and fried cashewnuts and raisins. One can serve it warm but I love eating this after it is chilled. This preparation thickens a lot on cooling so one can add more milk later to make it thin. Please start sending your entries to Flavours Of Punjab Event. I will be able to accept your entries now.The event ends Nov 30th. sorry to hear about sad news. The paysam looks delicious. Really appreciate your spirit to make a post,even in ur momemt of sadness.Thank you for sharing this wonderful recipe. May your FIL's soul rest in peace. This is a very delicious kheer. Never made it before.Looks very yum. Nice to see you back with a nice sweet. Hope you must be recovering from those very sad moments.May his soul rest in peace. glad to see u back...very new recipe..im sure anyone will luv this kheer..yum ! btw have just sent u a link for the ongoing event flavours of punjab..hope u recvd it..tc ! Glad to see u back with ur dads fav dish.. this sounds interesting and i have made this before.. i really liked this recipe and looks so so delicious. Nice sweet in remembrance of your father. May his soul rest in peace.And welcome back. Truly sorry to hear about losing a loved one. May god give you the strength and power to heal/cope up with your loss. Sorry for ur loss Pari..happy to see u regain ur spirits to make this lovely payasam in his memory! our family loves them too. We call it happalada payasa :) Great step-by-step information. Also, sorry to hear about the loss. Rest in peace. Nice to u see u back Pari, am so sorry to hear about this sad news, take care..btw payasam looks very tempting and delicious.. Sorry to hear that, may your FIL's soul rest in peace. Sorry to hear about ur loss..may god give u strength.Delicious payasam. Hi Pari, Glad to see you back dear! Very thoughtful of you to make this kheer..may God rest his soul in peace! glad to cee ur post,..payasam looks too yum,. Hi Pari, Hope you are feeling better now dear, It takes a while to get away from thoughts though.., It's a lovely recipe to remember him by.., Glad to see you back, take care, love to see your delicious visible treets.. 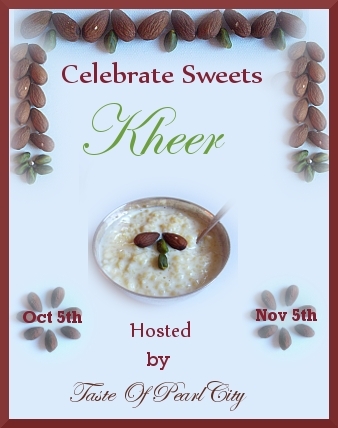 Wonderful and lovely kheer on you FIL's remembrance. Awwww :( Sorry to hear that sad news... You made a lovely dish. Sorry to know about your FIL, May his soul rest in peace. Thank you for sending this delicious kheer to the event. has been really long since i had this.Made it yesterday after seeing it on your blog..